Recently Ottawa Golf Blog got a chance to conduct a little phone interview with Karl Swan, Kartel managing director. It was early morning here in Ottawa when I spoke to Karl from Dublin. He was eager to talk about the G-Mac by Kartel line of golf clothing. Having recently been to the PGA of Alberta Buying Show in Edmonton. Karl had lined up a third party distributor in Canada. Looks like it will be easier to get our hands on the G-Mac line come Spring 2013. Great for Canadian golfers who like to wear stylish quality golf attire. Ottawa Golf Blog: For those not familiar with the Kartel name give us a little of your history? KS: Business was founded in 1947 by my Grandfather. He was a Master Taylor. You know one of these guys that would cut fabrics and make you a suit to measure. So the heritage of the business is very much centered around that attention to detail in cut and fabrics and fit. So over the last 65 years the business has developed into a line of casual lifestyle clothing, obviously the suits jackets trousers division and the golf division. The golf division is the newest part of the company, been around since the mid 90s. So they're the three main divisions of our business. It is still a family run business that's distributed in now about 32 countries. The golf line around since the 90s being the newest part of the business. 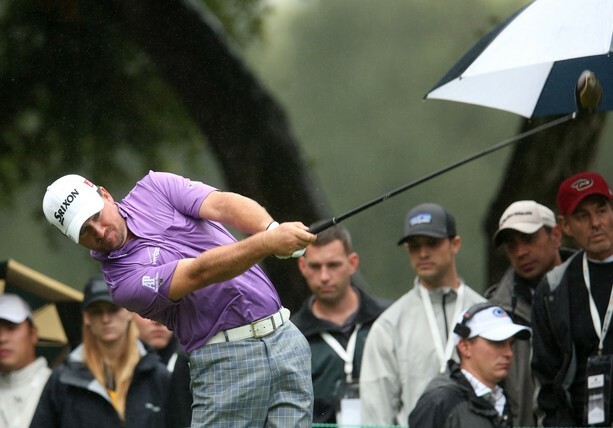 That area of the business is best know with our association with Padraig Harrington. We teamed up with Padraig Harrington and teamed up with him as our brand ambassador with this new line we were launching in 1996. Only a few weeks after turning pro he won the Spanish Open and then in subsequent years went on to win three majors. He had our brand clear and center on his chest and his collar through those major wins. Its been a great tool for us to promote the brand and to promote our association with one of the worlds greatest golfers. To launch these brands in some new markets. And now with Graeme also wearing the brand on his shirts and the G-Mac line we now have another of the worlds best golfer, also an Irishman. Helping to promote not only the brand but the Irish heritage of the brand. So as you say we're not that well know in Canada yet but we're certainly hoping with our association with Graeme and Padraig that we'll be accepted as a serious player in the market. KS: They just absolute heroes over here in Ireland. Padraig because he still lives here and he,s very well known by the media and he has all the time in the world for them. They all have strong personal relationship with him because he's so generous with his time. The guy next door, a regular Joe. The same is true for Graeme in the US . He's better known by the US media and seems to have that very open and honest way of dealing with people. Very relaxed with company and he truly is , he's just a regular Joe. He just has so much time for people that he doesn't even know. You see these leading stars on the tour on TV and the perception hasn't been helped by Tigers relationship with the media .Tiger doesn't seem to have time for anyone in the public. Whereas Graeme is the total opposite. After one of our photo shoots in December in Lake Nona where Graeme lives we finished up. We had a little crew there, of regular Joes who Graeme wouldn't have known from a bar of soap and after we finished Graeme says, "What are you all doing? Do you fancy coming for a beer? Usually you wouldn't get a person like that spending that time after the working hour with the workers if you'd like. That's the way he is, he has time for everyone. And even when we were walking down the main street in Lake Nona to the bar some guys across the road shouted "Hey how you guys doing". Graeme jogs across the road and pressed the flesh with them. I say to him, "Does everyone know each other in this town". No he says I don't know them. When someone says hello its rude not to say hi back. So even though he didn't know these guys he went across the road and offered his hand. He really is a people person and people see that. And it certainly helps with what we're trying to do. Ottawa Golf Blog: After making inroads in the US in 2012 with offices in New York and Miami any plans on adding Canada to list of Countries with distribution offices? KS: We've decided to use a third party distributor to branch out in Canada. That's why we were out in Edmonton for the PGA Buying Show to meet up with our Canadian Distributor . The economy is very buoyant in Canada so that's why we wanted to get on board. European market is challenged right now. Kartel is looking at expanding markets and with Canada's thriving economy it seemed like a natural fit. A good healthy number of golfers. We're established in the US right now and it's firing on all cylinders. We are happy with the progress we are making in the US. We've taken the direct approach in the US. We have our own direct appointed sales agents. We have a sales manager who works only and directly with our company and we have a pretty strong handle on the US market. It's been a significant investment one our behalf. With the Canadian market being a bit smaller we wanted to take it a bit more tentatively at first and so we are working with a third party distributor there. They are a company called Woods Golf Limited. It's a relatively new business it's certainly pitching to the upper end of the market, nicer green grass pro shops. We thought they were a good fit they carry a couple of other brands. Which are a good fit for our company. Spring 2013 will be our first season delivering into the Canadian market. I'm sure at first it will move relatively slowly that's the way these things work. We just try to encourage companies to dip there toes in and to see if its right for them. And ultimately for both. Ottawa Golf Blog: With so much competition in the Golf Apparel Market in North America how will the G-Mac line by Kartel gets its piece of the pie? KS: It's really color Sean! Is our thing. We are very progressive and obviously being European based we have a good handle on color. We work with Europe's foremost experts on color. She's a professor for The London College of Fashion as well as a director for Première Vision based in Paris. She helps dictate to leading industry experts what's going to be the popular colours for the forth coming seasons. She works with us and very closely with the colouring of our collections. So the collections are put together with very fashion forward colours but in such a way they are more appealing for the conservative guy if I can put it that way. We don't use big splashes of color like say Puma might or more directional brands might use. The way they use colours is fantastic but it appeals to a more younger guy. We want the slightly more mature guy to feel more fashion forward like he's wearing the on trend colours. We put them together in a way that they are more conservatively designed. They are natural bed fellows. 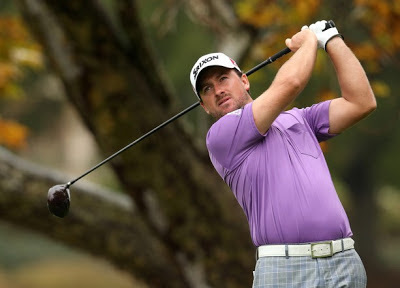 Ottawa Golf Blog: How much input does Graeme McDowell have on style/colors/etc. of the G-Mac Line? KS: Kartel is constantly evolving. Graeme feedback is really critical for the development and the progression of the brand. Look Graeme gives us that feedback he loves that vintage look and that's the kind of style we've built this brand on. A modern vintage vibe. And it's really on how to progress in ways that are true to that look. So we're using more retro designs, little tight micro strips, polka dots which are strong themes that were relevant in the 50s 60s, the Bobby Jones vintage era. They are the style nuances that you'll see coming through with the brand as oppose to a more modern flamboyant look. It's understated and a bit of throw back to the vintage era. He has a firm grasp on it he won't let up. He's like a dog with a bone. We've designed two season now and Graeme has love then both. He's given input on them both. We've interpreted the feedback he's given and produced two collections. He's really happy with them and so when it came to designing Winter/Autumn 2013 I had this conversation with his manger. We've finished the designs we are real happy with them can we truck along with them and develop those or does Graeme still want to be involved. You know you don't want to trouble a guy that's got so much to focus on. So he goes good question, yes Graeme wants to be involved. He has a passion for fashion . He wants to be involved in the design process. So he is, he sits in on meetings makes recommendations and feedback. He requests certain designs/fabrics be used. He's very into fabrics, they need to perform a certain way. So his feedback is very important to the design and direction of the brand. He has a really strong appreciation for quality and style. He's one of the very few that understands what looks good on him and why. And how to develop and design a collection around him. Most of us will pull on our favorite shirt/sweater we feel comfortable in it and we like the look of it on us. We can't necessarily tell you why it looks good on us. it just does. Some things look better on me in my wardrobe. Graeme has a pretty good understanding of what looks good on him and why and the type of colors that work best with his complexion. The designs that work best for his body shape. He's been very good at communicating how best to work with those styles that work best with him. The great thing is that the stuff we're producing is completely authentic to Graeme's style but also the great thing about this in my view is that Graeme's physique is not that of a tall thin Swedish athlete or some of these other guys that would look great in just about anything. Graeme's body shape is just irregular an everyday guys body shape for the most part and that's who we're targeting with the G-MAC line. So there's that sense of reassurance that if it looks good on Graeme it will look good on your average Joe. Ottawa Golf Blog: Describe the G-Mac with three words?